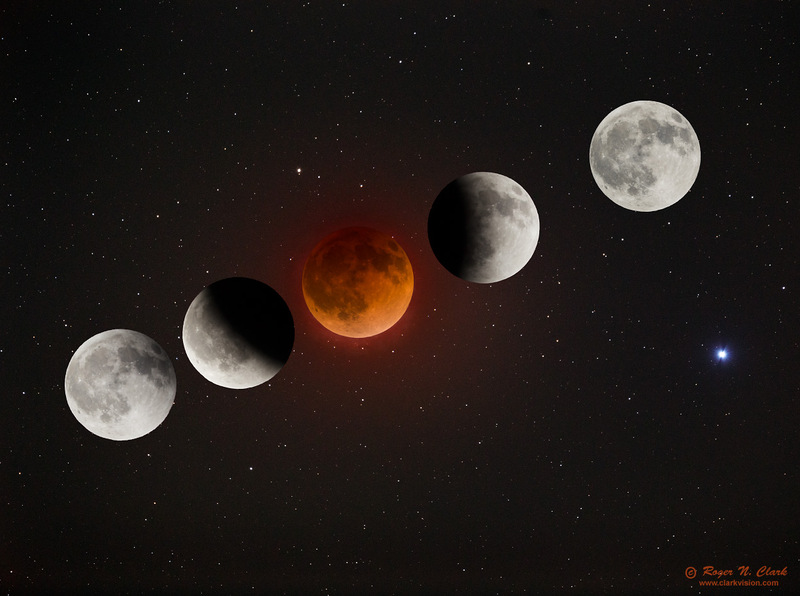 The Lunar eclipse of April 15, 2014. During mid eclipse, with the Moon quite dim, many stars can be seen and photographed near the Moon. In this view, stars a bit fainter than magnitude 15 were recorded. Stars that faint can be seen visually in telescopes with at least 8-inches (20 cm) aperture. Added to the mid eclipse image, are other views of the Moon during the eclipse. The Moon images in partial eclipse, flanking the copper-colored mid-eclipse, nicely demonstrate the round shadow of the Earth, proving the Earth is round. The bright blue star at lower right is Spica, Alpha Virgo. The bright star to the above left of the copper-colored eclipsed Moon, by about 1 lunar diameter, is the unaided eye star h Virgo (HIP 66098), magnitude 5.2. Celestial north is up in this image (at about the 11:30 position on an analog clock). Technical. Canon 6D 20-megapixel digital camera, 500 mm f/4 telephoto lens. The copper-colored Moon at mid eclipse plus the stars is a High Dynamic Range image (HDR) using two exposures: 1) 2 seconds at f/5.6, ISO 200, and 2) 30 seconds at f/4, ISO 1600. Note ISO does not change the amount of light gathered, only aperture and exposure time do. The higher ISO simply digitizes finer detail that brought out fainter stars. Thus, the true exposure ratio was 30. With such long exposures, the Moon and stars were tracked using a Losmandy G11 equatorial mount. The exposure times of the Moon from right to left (the time sequence of the Moon moving through the Earth's shadow) were: 1/400 sec. f/10, 1/320 sec. f/8, 2 sec. f/5.6, 1/320 sec f/5.6, and 1/640 sec f/7.1, all at ISO 200. Full height image, cropped slightly on the right for composition.